LANCASTER – The Los Angeles County Sheriff’s Department’s Vital Intervention Directional Alternatives (VIDA) Academy is accepting local applications for an upcoming class. The 16-week class will start on Saturday, Feb. 16, and participants will graduate on Saturday, June 8. The VIDA Academy is designed for “at-risk” youth between the ages of 11 and 17 who may be struggling with issues such as defiance, anger, failing grades, truancy, family discord and substance abuse. VIDA is an opportunity for participants to work with law enforcement and other community-based organizations to create positive influences in their lives that will encourage them to succeed and take responsibility for their future. The program incorporates physical fitness, impulse control, life skills training, emotional management techniques, conflict resolution and community service. 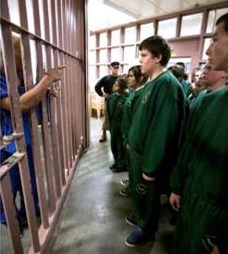 Participants are referred to VIDA through the juvenile courts, schools or by their parents. To learn more about the program or to register a participant, visit www.vida.la or call 661-949-6585 (Lancaster) or 661-265-8910 (Palmdale). 1 comment for "LASD VIDA program accepting local applications for upcoming academy"